Smashing Magazine has assembled a gallery of texture photos free for personal or commercial use. Browse the categories here and download to your heart's content. You have read this article downloads / graphic design / resources with the title May 2008. You can bookmark this page URL http://jenkrebs.blogspot.com/2008/05/free-high-res-textures.html. Thanks! 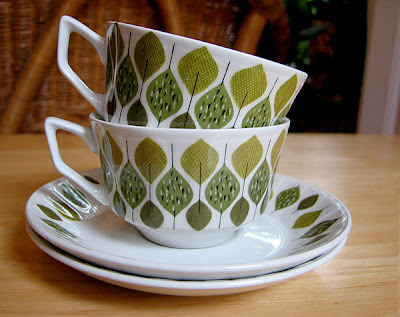 Look what I just bought from Golden Fruitfly's etsy shop. I fell in love with the pattern. The underside says Spanish Crown Ironstone, made in Spain. You have read this article favorite things with the title May 2008. You can bookmark this page URL http://jenkrebs.blogspot.com/2008/05/in-mail.html. Thanks! Julianna Smith, a Portland-based illustrator, has designed a couple of free recipe cards you can download. Get them here. You have read this article downloads / paper / printable with the title May 2008. 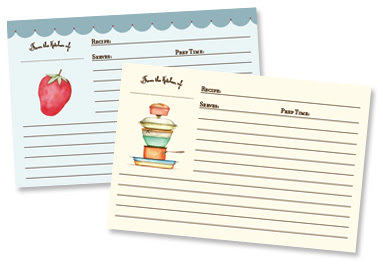 You can bookmark this page URL http://jenkrebs.blogspot.com/2008/05/printable-recipe-cards.html. Thanks! You have read this article with the title May 2008. You can bookmark this page URL http://jenkrebs.blogspot.com/2008/05/home.html. Thanks! Bye, guys. I'm going to a cabin in the woods until Monday night. (Monday's a holiday in the U.S.) Have a lovely weekend, everyone. You have read this article with the title May 2008. You can bookmark this page URL http://jenkrebs.blogspot.com/2008/05/back-in-bit.html. Thanks! 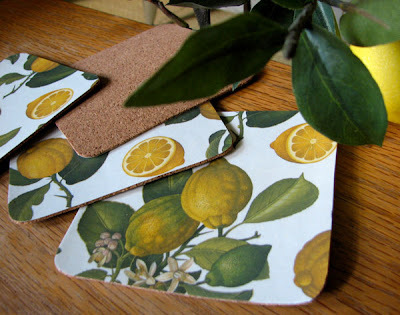 I bought this lemon paper ages ago because it matches our crazy fake lemon branches (see picture here). I guess I should say "faux" instead of "fake" to make stuff sound fancier. Anyhow, I bought it and then I couldn't think of anything to do with it until now: clearly the answer is more vinyl. I ironed it onto the paper, which worked great. (Except for the piece I ironed too long and the paper turned brown. Oops.) After vinylizing the paper, I stuck self-adhesive cork on the back and cut out squares. You have read this article coasters / paper with the title May 2008. You can bookmark this page URL http://jenkrebs.blogspot.com/2008/05/iron-on-vinyl-coasters-part-2.html. Thanks! You have read this article paper / resources with the title May 2008. You can bookmark this page URL http://jenkrebs.blogspot.com/2008/05/printable-pocket-photo-album.html. Thanks! At the local fabric store I found some iron-on vinyl to play with. It's pretty neat—you can iron it onto fabric or paper. I tested it by making coasters. 3) Place two of your newly laminated squares together, vinyl sides out. I secured mine a bit with a fabric gluestick to keep them from sliding around. 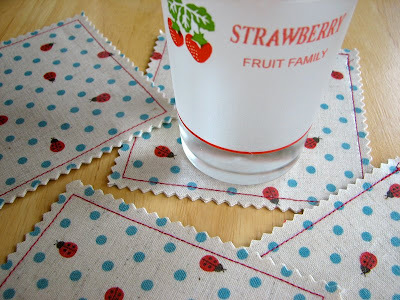 4) Mark a square on the fabric with a disappearing fabric marker and sew the pieces together, following your lines. 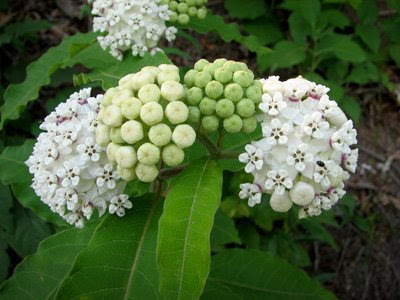 5) Trim the edges with a pinking shears. 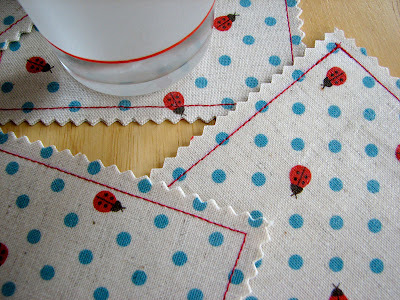 You have read this article coasters / fabric / tutorials with the title May 2008. You can bookmark this page URL http://jenkrebs.blogspot.com/2008/05/iron-on-vinyl-coasters.html. Thanks! You have read this article tutorials with the title May 2008. 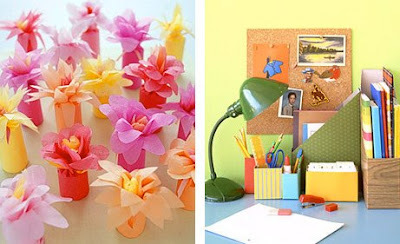 You can bookmark this page URL http://jenkrebs.blogspot.com/2008/05/more-diy-projects.html. Thanks! For those of us who don't want to spend our life's savings on a real Hermes bag, there's a customizable, downloadable paper model on their site. (Find the picture there that looks like the one above and click it.) I guess this little bag could sit on your desk and hold a jellybean or something. Thanks, Tsh. P.S. If you poke around the Hermes wonderland some more, you can find lots of nifty animations, games, and videos. You have read this article downloads / paper / printable with the title May 2008. You can bookmark this page URL http://jenkrebs.blogspot.com/2008/05/little-paper-hermes-purse.html. Thanks! You have read this article shop with the title May 2008. You can bookmark this page URL http://jenkrebs.blogspot.com/2008/05/pretty.html. Thanks! Reinaswan tagged me to list six unremarkable quirks, and I happen to be in the mood to do it. I'll pick three things I like and three things I don't like. 2) I get really crabby in airports and crowded, noisy places. 3) I think Crocs are the ugliest shoes I've ever seen. 4) I drank my first mojito last summer and it's my new favorite drink. I'm going to start growing my own mint to feed my habit. 5) I love the Olympics. This is peculiar since I have zero interest in sports otherwise. I wait and wait for an Olympic year to come around, and I'd rather stay home every night to watch the games than go out and have fun with people. Also, I'm so moved by this Adidas commercial and ad, and I think the Beijing Olympic mascots are ingenius. 6) In the last four days I have become addicted to eBay. I've only spent $15, but I can't stop browsing. Help, help! You have read this article random with the title May 2008. You can bookmark this page URL http://jenkrebs.blogspot.com/2008/05/six-things.html. Thanks! While procrastinating at my desk yesterday, I found myself staring at our letter opener and thinking how plain it looked. Clearly I couldn't keep using such an abomination. It must be decorated. See? It's so.... white. And those clips. So black. No fun. I'd seen some lovely binder clips available for purchase here and here, decoupaged with paper, but I wasn't sure how fabric would work. Experiment time. 1) I tried three options: fabric pieces with iron-on interfacing applied, fabric with HeatnBond applied (not that I was going to iron it to the metal, but it makes your fabric sort of papery when you've pulled off the backing), and just plain fabric. 2) Trimmed the pieces carefully to size. 3) Removed the wire handles of the clips (very easy). 4) Applied spray adhesive to the back of the fabric pieces and stuck them to the surfaces. 5) Reattached the wire handles. 6) Painted on two coats of gel medium (thinned with a little water) to seal the fabric on. Verdict: My interfacing was too thick. Not needed. HeatnBond was good, because it gave the fabric just a bit of stiffness, making it easier to position. Fabric alone worked okay, too. The gel medium seals it down so the edges won't fray. Happiness. You have read this article fabric / tutorials with the title May 2008. 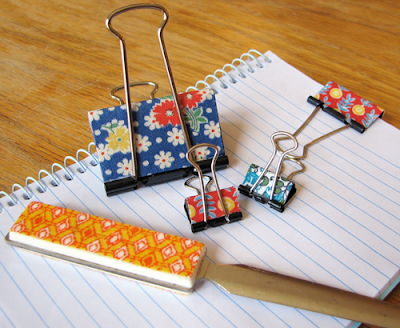 You can bookmark this page URL http://jenkrebs.blogspot.com/2008/05/decorate-office-supplies-with-fabric.html. Thanks! You have read this article help out / shop with the title May 2008. You can bookmark this page URL http://jenkrebs.blogspot.com/2008/05/wearable-statistics.html. Thanks! Some mugs I drew on with one of these pens I got at the local Blick art store. The pens are locked up in a cabinet so you can't sniff them. Or steal them? I don't really know why. But I felt faintly embarrassed to have to ask for something in a locked cabinet. Like I might be a criminal or something. And of course I threw away the package a long time ago and can't remember the instructions for how to set the ink. I think you bake it for awhile and then it becomes dishwasher safe. I remember dishwashing something I drew on once, and it stayed perfectly. Now I'll have to go back to the store and read the package instructions, but to do that, I have to make them unlock the cabinet again. Sheesh. Sorry for filing this under "tutorials" because it's not really, but I couldn't think of where else to put it. Once I find the directions again for setting the paint, I'll add them. Update: Called the store to get the instrux. The upshot is I used the wrong pen. There's not a way to set this pen, and it will never be dishwasher safe. It's not food safe, either. Turns out I used another pen before (which I can't find now). It's coming back to me... I bought this DecoColor marker to use for drawing on canvases I had painted with acrylic— no need to put those in the dishwasher. Heh heh. So now I have a couple nice pencil cups, I guess. You have read this article tutorials with the title May 2008. 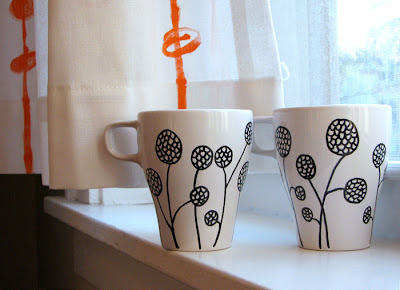 You can bookmark this page URL http://jenkrebs.blogspot.com/2008/05/decorated-cups.html. Thanks! You might have seen the Rather Difficult Font Game floating around the internet lately... have a go at it! But don't feel bad if you wouldn't know a Frutiger if it came up and bit you in the, um, backside. You have read this article fonts / graphic design / quizzes / time-wasters with the title May 2008. You can bookmark this page URL http://jenkrebs.blogspot.com/2008/05/quiz-identify-font.html. Thanks! I've added a little Etsy mini widget in left sidebar, in case anybody has spending money that's burning a hole in their pocket. I can't buy everything I like, but it's fun to window shop. You have read this article shop with the title May 2008. 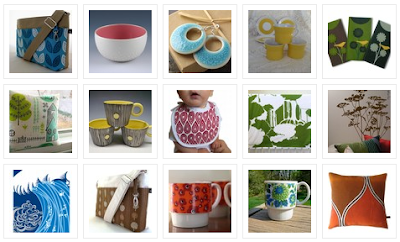 You can bookmark this page URL http://jenkrebs.blogspot.com/2008/05/etsy-window-shopping.html. Thanks! 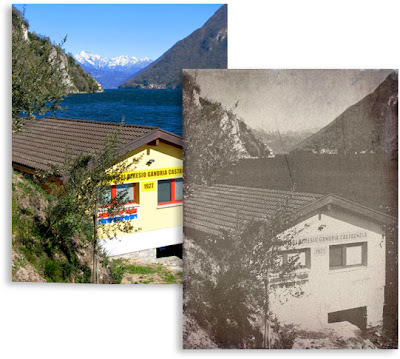 In the unlikely event you ever need to age a photo, here's a site that will do it for you. Upload your picture, press the blue button, and you'll get back a low res antique-looking snapshot. Via Photojojo. You have read this article resources with the title May 2008. You can bookmark this page URL http://jenkrebs.blogspot.com/2008/05/automatic-photo-oldifier.html. Thanks! You have read this article books / paper / tutorials with the title May 2008. You can bookmark this page URL http://jenkrebs.blogspot.com/2008/05/how-to-make-cut-paper-frames.html. Thanks!